Modern life is full of subscriptions: Netflix, Apple Music, Birchbox, magazines...so many that it's hard to keep track. 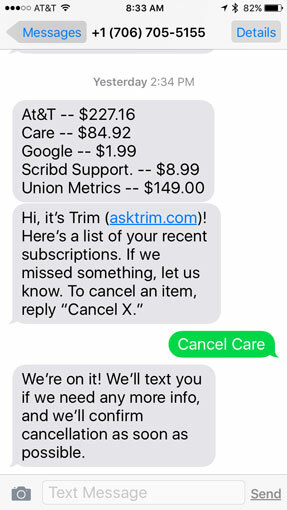 Trim is a new subscription tracker that makes it easy to keep tabs on the services you use and cancel the ones you don't. Companies make it easy to sign up for their recurring subscriptions, but it's all too easy to let them continue when you don't need them, whether i'ts because you forget about them or it's difficult to figure out how to unsubscribe. That's where Trim comes in. 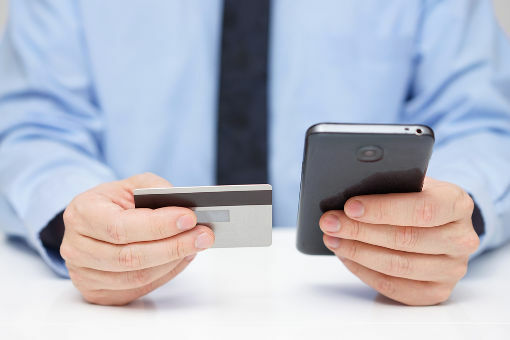 Trim takes a look at your credit or debit card information to pinpoint which of your payments are subscriptions by looking for charges for the same or nearly the same amount billed regularly within the past 90 days. It's smart enough to screen out regular purchases, like your morning coffee at Starbucks, even when your card data shows the same amount regularly paid. After Trim determines your subscriptions, Trim provides you a way to cancel any subscription. You sign up for the service at go.asktrim.com. Add your credit cards, and Trim will analyze your bill. Trim's software integrates securely with about 15,000 U.S. financial institutions (about 98 percent of the market), so it has a wide reach. Via SMS text message (it takes about a day), you’ll receive a list of all detected subscriptions and instructions on how to discontinue those subscriptions you don’t want, such as cable TV. To cancel a subscription, reply to the text message (for example, "cancel Netflix”). Not all subscriptions can be cancelled through SMS; some have to be handled personally. During private testing, almost all of the 100 testers were surprised to discover services on their subscription lists they had forgotten about. Among them was Experian’s Credit Report, which was cancelled by everyone who had it on the list. Trim remains SMS-based for now, but it could expand to include an online portal. The company is also investigating the ability to pause a subscription (great when you're traveling) and features for helping users with their finances and budgets.